The Research Data Alliance (RDA) currently hosts over 60 Interest Groups and more than 30 Working Groups consisting of experts who are working on various topics related to (open) research data and innovation. To give an overview of the RDA work that is specifically interesting for social sciences researchers, Ricarda Braukmann from Data Archiving and Networked Services (DANS) - the national RDA node for the Netherlands and RDA ambassador for the social sciences and humanities - performed an analysis assessing the relevance of the RDA work for this specific community. She presented her results at the International Conference for Social Sciences (ICSS XV) in Leuven this July. During this conference, about 300 social sciences researchers from more than 50 different countries came together to present their work. The analysis performed should be seen as a starting point for science researchers that are new to the RDA and wish to receive some guidance through the large amount of work and topics covered by the RDA. 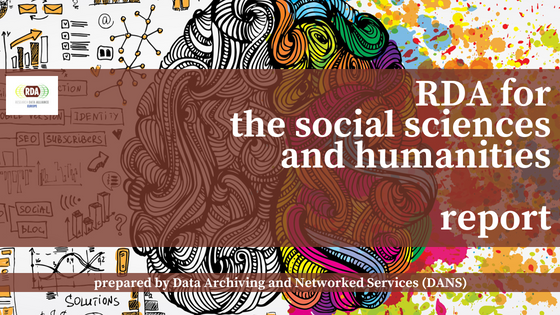 The report analyses RDA Groups, considered highly relevant if they covered topics that should be of interest for social sciences researchers in general. These topics, for instance, include dealing with privacy-sensitive data or RDA work on research data management. Groups that may be interesting for social sciences researchers depending on their exact field of research or particular interest were labeled as moderately relevant, while groups that did not fit into these prior categories were labeled as being low in relevance. A similar analysis was performed towards Recommendations and Outputs. Seven Interest Groups, two Working Groupss and two RDA outcomes were classified as particularly relevant to the social science community, covering topics like sensitive data, training and data management planning, as well as data discovery and standards for discipline-specific metadata. In particular, there are two outputs that we were considered highly relevant for social sciences researchers. The Metadata Standards Directory output provides access to a directory of metadata standards for documenting research data, regardless of academic discipline. It features information for metadata in the social sciences and can therefore be seen as a useful tool for social sciences researchers. Secondly, the output on Eleven Quick Tips for Finding Research Data provides eleven practical tips for data discovery which can be useful for social sciences researcher to effectively discover the data that meet their specific needs.